Android App wiping users memory | Android Blast! 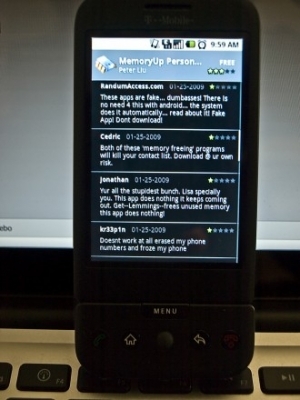 A new Android app called MemoryUp Personal appears to be causing problems for several G1 users. The comments section of the Android App Market includes claims by several users that the app is destroying their memory, and is a "scam." Users who downloaded the app claim the app installed adware, froze their devices, and deleted all their memory. Be careful when using MemoryUp.